Whitby Town welcome former Conference outfit Hyde United to the Turnbull tonight (Wednesday), 7.45pm kick-off. Blues boss Darren Williams is demanding that his side “play for the full 90 minutes” against the Tigers, after seeing his side drop more points against Grantham on Saturday. The Blues led 1-0 at half-time, following a decent first-half showing, but just as was the case at Workington last week, the Seasiders were off the pace after the break. 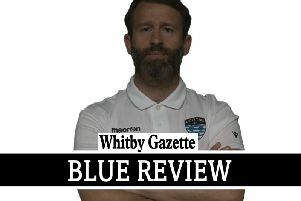 “The first half was good and we have created enough chances to win the match comfortably, but the lads cannot keep turning up and only performing for half a game,” Williams told the Whitby Gazette. “We need to play for the full 90 minutes, and if we do this then I’m confident that we can beat any team in this league. “The focus of what we said to the players at half-time on Saturday was ‘you’re doing well, keep it going and don’t let your standards drop’, but we switched off and once again conceded a goal right at the start of the second half. The Tameside club have suffered back-to-back relegations and lie 20th in the EvoStik Premier Division standings, despite defeating title-chasing Darlington away twice (once in the FA Cup). They were defeated 2-1 by EvoStik Division One North side Northwich in the FA Cup on Saturday, and are without a win in four games, since putting seven past Stamford last month. Under-16s are admitted free to the Turnbull Ground with a full price paying adult (£9). Under-18s pay just £3 and senior citizens £5.